People have been using Gmail storage space for backup purpose, GmailFS is one of such projects. What I propose here is to use Google Picasa: Storage space is unlimited, as long as your image dimensions do not exceed 2048x2048 pixels. By encoding data to appear as a image, you could potentially get unlimited storage space. Anyway, I would not use it for serious data backup, and I don't use it myself. I just thought the idea was fun. The total file length is 73305 bytes. This can easily fit in a 256x256 color image: each pixel takes 3 bytes, one for each of the 3 base colors (red, green, blue). 256 * 256 * 3 = 196608 bytes. But remember, you can store much more than that in one image: the maximum "free" image size is 2048x2048, that's 12 MiB. You just need to split your data in chunks of 12 MiB, and you can store as much data as you want. We are going to create a PNG file out of the data. We use PNG instead of JPEG, because PNG uses a lossless compression algorithm, while JPEG compression is lossy: it tries to minimize differences in image, according to what the human eye perceives. Good for pictures of real things, but not good when you're trying to recover the exact information you put in the image. convert: unexpected end-of-file `myfile': No such file or directory @ error/rgb.c/ReadRGBImage/231. This is because the text file is not long enough to cover the whole 256x256 image. The notrunc option makes sure the output file is not truncated before the content of myfile is written. And we get this (not-so-)beautiful image. You can see some black lines patterns in the image. This corresponds to the new lines in the base64 encoded image: every 77 characters, there is a line feed. The line feed has ASCII value 10, i.e. quite dark, while the rest are printable characters with values above 60 (darkish gray). And you can check that myfile and myfile2 are identical. We could of course automate the process, but that's not the point here (feel free to do it if you want to take the risk of using Picasa as a sharing facility). A nicer, and more "subversive" way is steganography. 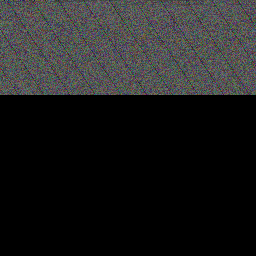 Steganography embeds data in an otherwise normal looking image. But that will be for another post. "Upload any Kind of File to Your Music Cloud Service"
Thanks for the tip! Indeed, that's a fairly similar idea. Google Play music doesn't work in Singapore yet, so I can't test. And my solution provides completely unlimited storage (well, 5.7TB on Google Music is close to unlimited, anyway ,-)).